Bernardo Fiol-Costa (center) is president and founder of The Big Think Group in San Juan. That statement became my mantra as soon as I knew my family, friends and employees were safe after Hurricane María wiped out Puerto Rico’s power, telecom, and basic needs infrastructure. Yes, we have helped in volunteer efforts and community building initiatives, but making sure that my clients were properly served and that we kept our jobs became a top priority, especially the first days after the storm. As all wireless telecom systems collapsed, we needed to get in touch with our clients, immediately. No calls, no texts, no email – nothing worked. We are communications experts and we must be available. So just like in the old days, we stopped by each of our clients’ offices – even at their homes – unannounced. It was worth it. Because of lack of electricity and safety issues, we couldn’t go to our office – but it didn’t stop us. We’ve become WiFi pirates, expert nomads, temporary tenants in Client’s offices. For many, co-working spaces and backpacking travel are a fad; for us, it’s survival. With low Internet, cell phone and TV penetration, audiences turned to radio to get their messages. It was literally time travel – writing down PSA’s with pen and paper – and driving to the radio stations to deliver them. Egos at the door, please. As all our client’s existing plans changed overnight, so did our roles. Need a driver? Lunch delivery? Babysitting? (Not exaggerating). We’ve done it all. But we’ve been side by side with our clients, weathering the aftermath, blessed to be working. 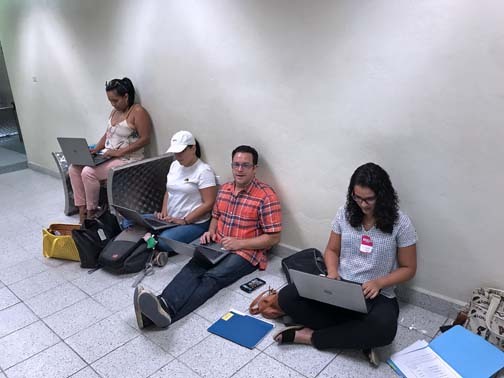 It’s been more than a month after María hit, we haven’t been able to return to our office and we are getting used to our “new normal.” We might still be deprived of electricity for many more weeks, but we have power. The power of resilience. The power of having a job and serving our clients. The power of “Ricanstructing” a new Puerto Rico. Editor’s Note: This column was previously published in www.prconsultantsgroup.com. Hey Buddy!, I found this information for you: "Op-Ed: ‘Ricanstructing’ our business after María". Here is the website link: https://newsismybusiness.com/ricanstructing-business-after/. Thank you.